Sergei Filin's attacker, former Bolshoi Ballet soloist Pavel Dmitrichenko, has been released on parole two years into his five-and-a-half-year sentence. The dancer reportedly had seven commendations in jail for good behaviour and never infringed his prison requirements, according to the court who freed him. The attack driver Lipatov has already been released, it's reported, while the actual acid attacker Zarutsky remains in jail serving a nine-year sentence. No news as yet on Dmitrichenko's physical state but he has apparently thanked his supporters on his Facebook page. Here is the report by news agency RIA Novosti. VORONEZH: A Ryazan district judge has given exemplary behaviour as the reason for the release from prison on parole of the former Bolshoi Ballet soloist Pavel Dmitrichenko, who was jailed for 5 and a half years for attacking the Bolshoi Ballet’s former artistic director Sergei Filin. 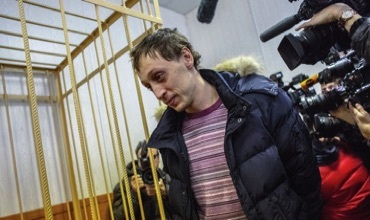 Yesterday it was revealed that the court had decided to parole Dmitrichenko, who has been serving his sentence in the Ryazan district. "The application by attorney R Y Sidorin and prisoner P V Dmitrichenko for the prisoner’s release on parole while serving his sentence is allowed, as the court takes into account his positive behaviour,” said a statement. In particular the court noted that Dmitrichenko had acquired seven commendations “for conscientious labour” and “exemplary behaviour”, and had not infringed his regime. In addition, he had paid the damages awarded to the victim in full. His sentence was due to end on 4 September 2018, and he became eligible for parole on 5 December 2015. “Pavel Vitalevich Dmitrichenko is released on parole from serving his sentence, with an unexpired term of two years, three months and 16 days,” said the district court. The attack on Filin took place in Moscow on 17 January, 2013: the ballet artistic director was splashed in the face with acid, as a result of which he was hospitalised with third-degree burns to his face and eyes. Filin underwent more than 20 operations on his eyes. Bolshoi ballet soloist Pavel Dmitrichenko and two unemployed men were arrested and tried for the attack, a former convict and Ryazan resident Yuri Zarutsky, whom the investigation found carried out the attack in person, and Moscow district resident Andrei Lipatov, who drove Zarutsky to the scene of the crime. Dmitrichenko and Lipatov denied their guilt, while Zarutsky insisted that he alone had planned and carried out the attack. The Meshchansky court found all three guilty in December 2013. Later the Moscow City court altered the Meshchansky court’s sentences, reducing Dmitrichenko’s prison term from six years to five and a half years, Zarutsky’s jail term from 10 to nine years, while Lipatov got two years. Lipatov has already been released from prison having served his full sentence.